As a leading manufacturer of components and systems in electrical engineering and automation technology, Eaton's Electrical Sector is presenting two new Eaton SmartWire-DT business partners at SPS/IPC/DRIVES: Hilscher, a system automation company in Hattersheim and a leader in industrial communications systems, and Wöhner in Rödental, a specialist in bus bar system technology. At the trade show in Nuremberg, Eaton signed cooperation agreements with Hilscher and Wöhner in which both companies declared their intention to integrate the SmartWire-DT interconnection and communication system from Eaton in their products. This year, Eaton and Phoenix Contact, Blomberg, also announced a business cooperation with the electronic Contracton motor starter and SmartWire-DT at the Hannover Messe 2011. With the philosophy of "From Lean Connectivity to Lean Automation", Eaton is pursuing the objective of both streamlining control cabinets, reducing wiring and interfaces to a minimum, and increasing machine and system transparency. A "lean automation" solution comprising SmartWire-DT and HMI/PLC technology reduces the work involved in project planning and start-up, boosts performance, cuts costs and ultimately means fewer sources of error and greater flexibility on modular machine concepts. Eaton is cooperating with a range of SmartWire-DT partners on its vision of "From Lean Connectivity to Lean Automation", providing their products with both a SmartWire-DT master and a slave connection. Craig McDonnell, head of the Eaton Automation Business Unit (IAB) in Eaton's Electrical Sector, said, "We are very pleased to have gained two new, leading technology partners in Hilscher and Wöhner. It shows that Eaton's SmartWire-DT technology has established itself in the market and that customers will enjoy even greater benefit from our technology." 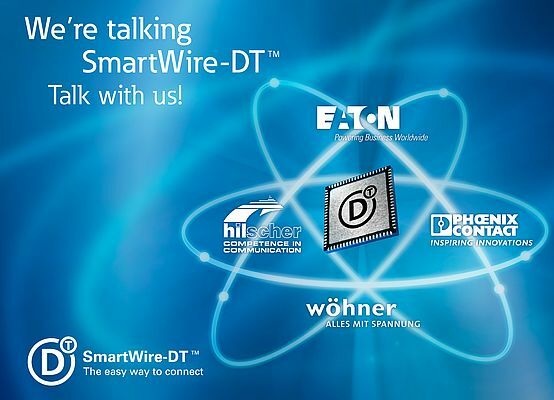 Richard Boulter, Senior Vice President Industrial Control Division, Eaton Industries, commented on the cooperations: "The expansion of the SmartWire-DT product range with our business partners makes our strategy 'From Lean Connectivity to Lean Automation' even more attractive for our customers".